Our PT20® Trap is a single chamber specimen trap with fine-mesh screen to capture even the tiniest polyps or specimens. The most popular version of the PT20 for Endoscopy is shown above (without connector). 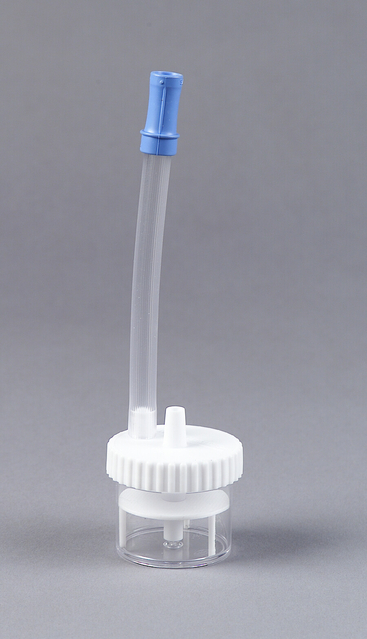 The PT20®C Trap can be used with systems in addition to our DM6000 Series Suction-Drain™ System. (e.g. Stryker Neptune). For some of these applications, such as Arthroscopy, the blue connector shown above is better suited to larger-diameter tubing connections. Either version of PT20® Trap is available in quantities of 10, 25, 50 or 100 each, commonly ordered by item number PT20-100, PT20-50, etc. and PT20C-100, PT20C-50, etc. Quantities of 50 or fewer are individually packaged, while package quantities of 100ea. are bulk-packaged. Please contact us with any pricing and delivery questions.